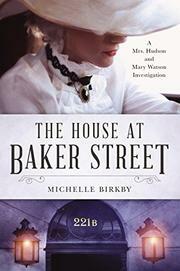 Sherlock Holmes’ landlady and Dr. Watson’s wife take on a case of their own in this debut mystery. After losing her husband and young child, Martha Hudson began to take in lodgers to make ends meet. When an eccentric, reclusive man asked for rooms where he could conduct chemical experiments and ballistics tests, she could sense that he needed someone to care for him and leapt at the chance for some excitement. Now, having eavesdropped for years, Mrs. Hudson has learned a great deal about deduction and become fast friends with Mary Watson and the band of scrappy orphans known as the Baker Street Irregulars. So when Laura Shirley arrives at 221B Baker St. with a story too shameful for her to confide in the great Sherlock Holmes, Mrs. Hudson and Mrs. Watson draw out the tale with tea and sympathy. Mrs. Shirley has been receiving letters threatening to divulge to her husband the most scurrilous rumors with no basis in fact and no price demanded to stop them—blackmail not for profit but for pure malice. Dozens of other women have received such letters too, including the reclusive Whitechapel Lady and “the Woman” of Holmes’ obsession, Irene Adler. The letter writer continually torments his targets until he ruins lives. Now he’s escalated to bloody murder. Can Mrs. Hudson and Mrs. Watson stop him before he kills again? Appealing characters, gruesome homicides, and a detailed period setting in a blend as balanced as a perfect cup of tea. Enjoyable fare for both die-hard Sherlock-ians and newcomers to the canon.